Art, natural history and geology intertwine to form the captivating National Museum and Gallery, a sight that’s perfect for inquisitive explorers and art enthusiasts alike. Its unparalleled exhibitions and events, including a highly visually pleasing depiction of the evolution of Wales, thrill all kinds of people, from curious college kids to festive families. 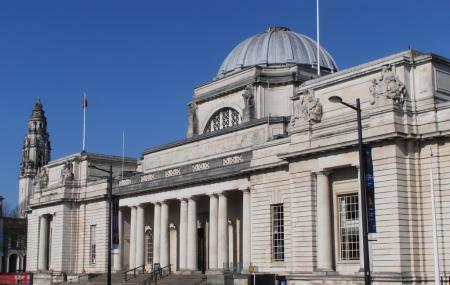 Founded in 1905, it came into being when the city was gifted the “Welsh Museum of Natural History, Archaeology and Art” Its doors were opened to the public in 1927 and today, its vast collection of archaeology, botany, fine and applied art, geology and zoology make it stand out. A visit to the museum today will keep you busy. Hung at eye level, you can study each soft stroke and lovingly created composition as you walk through the exhibits which display over 500 years of work. You’ll be able to surround yourself with a great variety of artwork, from local artists whose works document the changing Welsh society, to internationally renowned painters such as Money, Sisley, Bonnard and Hogarth. There are different collections of beautifully painted porcelain tea sets from China as well as locally made. Combined with intricately patterned silverware, delicate glasswork and some contemporary ceramics, the Applied Art section is quite exquisite. Wales was once filled with woolly mammoths, dinosaurs and a host of other great beasts! ‘The Evolution of Wales’ is a fantastic exhibit that spans the birth of the country, right from the Big Bang and 4,600 million years hence, which is where we stand today. Explore the colourful woodlands, the darkness beneath the seas, Skomer Island and the variety of life that thrives on, in and under all these areas in the Natural History section. You’ll marvel and the sheer enormousness of the huge models of the Basking Shark and Humpback Whale and stare in awe at the eerie pitcher plant and 1.2 meter giant earthworm. The Clore Discovery Centre is where you can actually study fossils, insects and ancient weaponry under microscopes and even bring in your own objects for identification. There’s also a section where all kinds of talks, performances and live demonstrations take place. Have you ever thought that when you buy tickets for National Museum and Art Gallery of Cardiff tours, you will be offered an engaging world of art and natural history and geology at one place only! National Museum and Art Gallery tickets offer you a plethora of knowledge domains in comparison to the small amount that is charges. Tickets for National Museum and Art Gallery assure you a session of enlightenment regarding the present and past world around us. And if you are thinking what are the National Museum and Art Gallery ticket prices, you can visit our tickets section for detailed information. Tips and Warnings: The museum closes during demonstrations/protests held by the Public and Commercial Services (PCS) union. There is wheelchair access to all galleries. Most galleries can be visited independently, but lifts to some galleries must be operated by a Museum Assistant for security reasons. There are signs indicating the location and operating instructions of all lifts. Museum staff is nearby to help. A variety of seating is available throughout the Museum. The Evolution of Wales, Natural History and Man & the Environment galleries all have audio material to support the visual exhibits. Only assistance dogs are allowed on site.Dogs must leave the premises to relieve themselves and staff will assist in identifying a suitable area. On Foot/ Bicycle: The Museum is 20 minutes walk from Cardiff Central Bus and Train Station. Bus: From Cardiff Central Bus Station take bus number 53 or 85 to the Museum. From Cardiff Bay take the Bay Car bus number 6. How popular is National Museum And Art Gallery? People normally club together City Hall Lawn and Millennium Stadium while planning their visit to National Museum And Art Gallery. The museum is located in a beautiful area. There was no line to get in when we arrived and it was free entry which was great. They had some really interesting exhibits and some great art on display too! The staff were very knowledgeable and friendly, willing to have a chat about the pieces ! There was plenty of places to sit down throughout the museum which I thought was great and there was also a cafe and a small gift shop which was priced well. I loved the museum. Such a great place to visit. So much history, I loved the dinosaurs and everything about the solar system and the crystals. There's about 5 floors from what I remember and each floor and something different. The history of art really interesting too, some beautiful painting. Definitely worth a visit. Free to enter main areas, although special exhibits may incur a fee. Only had an hour or so before heading home and was wonderfully surprised by the exhibits. The "how Wales was formed" part was very interesting and seamlessly led into the dinosaur exhibits which were very well laid out and interpreted... Overall much better than expected. Next time we visit we shall allocate a lot more time to the visit. Wow, what a fantastic museum for free. Huge amounts to see. Art of all periods and style. Natural history of Wales in chronological order is very good. Really interesting artifacts. Very impressed as we've paid more for a lot less. Great afternoon activity. Worth a visit for the History of Wales exhibit which seems semi permanent. Various other exhibits changed from time to time. Free entry, Coffee shop snack bar in the entrance hall and more substantial menu in the basement restaurant.